Most of the characters and names in Winnie the Pooh were based on creator A.A. Milne’s son’s toys and stuffed animals with the exception of Owl, Rabbit, and Gopher. 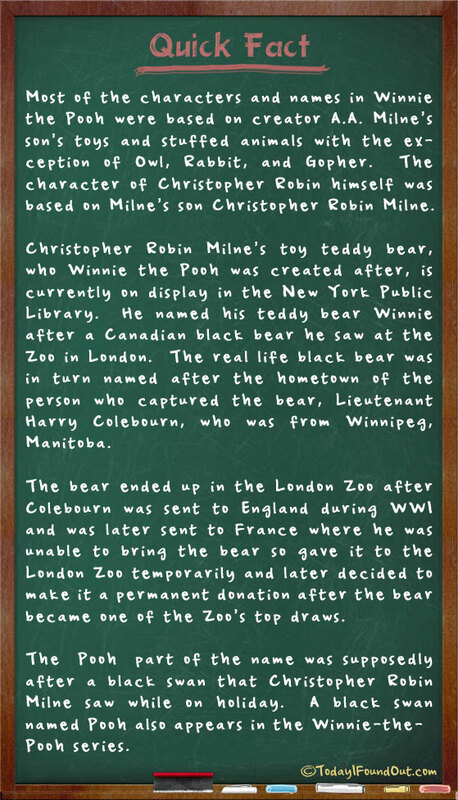 The character of Christopher Robin himself was based on Milne’s son Christopher Robin Milne. Christopher Robin Milne’s toy teddy bear, who Winnie the Pooh was created after, is currently on display in the New York Public Library. He named his teddy bear Winnie after a Canadian black bear he saw at the Zoo in London. The real life black bear was in turn named after the hometown of the person who captured the bear, Lieutenant Harry Colebourn, who was from Winnipeg, Manitoba. The bear ended up in the London Zoo after Colebourn was sent to England during WWI and was later sent to France where he was unable to bring the bear so gave it to the London Zoo temporarily and later decided to make it a permanent donation after the bear became one of the Zoo’s top draws. The “Pooh” part of the name was supposedly after a black swan that Christopher Robin Milne saw while on holiday. A black swan named Pooh also appears in the Winnie-the-Pooh series.